World 1-5 is a level in World 1 of New Super Mario Bros. 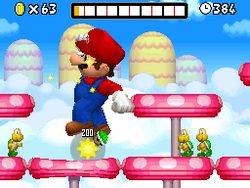 The level starts out on a basic red Mushroom Platform, which leads into many pink Mushroom Trampolines. Towards the middle of the row of Mushroom Trampolines is the first Star Coin, surrounded by four normal coins. At the end of the Mushroom Trampoline row, there are two scales that fall if Mario stands on them for too long. The second Star Coin can be found soon after the platforms. Afterwards, there are four scales and a Warp Pipe above the platforms. Inside the pipe is a Coin Heaven with a red Mushroom Platform, which moves across rows of regular coins. The final Star Coin can be found in the middle of the coins. Afterwards, the player drops down out of the Coin Heaven, and then they come to another row of Mushroom Trampolines and a Red Ring. If the player goes into the ring, they must grab the eight Red Coins while avoiding a Goomba and a Koopa Troopa. Afterwards, there is another long row of the Mushroom Trampolines, with a row of Coin Blocks on top of them. At the end of the row, the player can find the Goal Pole. Star Coin 1 - The first Star Coin can be found plain sight. Mario should use the bouncy mushrooms to collect it. 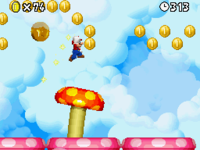 Star Coin 2 - Mario should use the scales to reach the second Star Coin on top of a mushroom. Star Coin 3 - By entering the pipe to the Coin Heaven, Mario should ride the mushroom all the way to where the final Star Coin is. This page was last edited on April 13, 2019, at 11:54.